Do Paper Toilet Seat Covers Really Prevent the Spread of Germs? Toilet seat covers always have been and always will be at the center of debate considering the number of germs that float around public bathrooms. In fact, public bathrooms are so germ laden that there are many customers who will completely avoid them in public. The big problem with that, is you often end up with a perfectly good store, and a lot of people who won’t stay in it simply because they can’t use the bathroom there. That might sound a little ludicrous, to put it lightly, but it does happen, and it is a serious problem. That being said, you need to figure out a way to solve your contamination issues, and one of the more popular methods out there has been to use toilet seat covers, though we will say that it has been met with some resistance over the years for a few potentially good reasons. The main question that many people tend to have is whether or not the toilet seat covers are actually effective. Do they really even stop the spread of germs? Well, we can’t say it’s a bad question, but first, what kind of germs would paper toilet seat covers actually prevent? This list is not exhaustive by any means, but we have made an effort to list some of the more dangerous and life threatening ones. If we were to expand on this a little bit, then we would go on to say that Ebola is a theoretical possibility in some bathrooms. Now there is a theory that these diseases cannot be transmitted by a toilet seat simply because the skin is enough of a barrier against them, but what this theory does not take into account are open wounds. For example, if you have a cut on your leg or buttocks, it would be easier for bacteria to enter your body and cause an illness, which is where toilet seat covers might come in handy. Do Wholesale Paper Toilet Seat Covers Really Help? It’s going to be a matter of great debate, no doubt, but the general theory here is that when you have a paper toilet seat cover, especially one that slides around quite a bit while you are using it, it won’t provide the protection hat you need. Essentially it is there only to look good and provide some kind of psychological relief or peace of mind. That’s a good thing, but it certainly doesn’t solve the problem. That being said, you need a better solution – one that’s going to hold up without threatening your users. You need a solution to your problems, and Brill Seat might just have it for you. 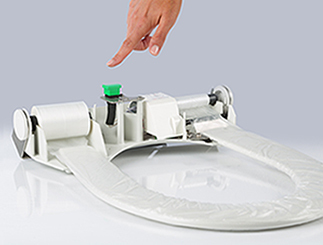 This isn’t a paper toilet seat cover solution, but rather a plastic sleeve that fits around the custom built seat. In the end, no one ever has to touch the seat, at least not physically. The sleeve is recycled each and every time the users sits down, which certainly changes things. There was definitely a time when one had to wonder if the covers were really doing anything and now we have a definitive answer: yes they do. It’s time to stop using those paper toilet seat covers, and time to start utilizing a solution that will not only make your current customers feel safer, but also bring in new customers for your business. You are going to be utterly amazed at how much business properly outfitted bathrooms can actually bring. 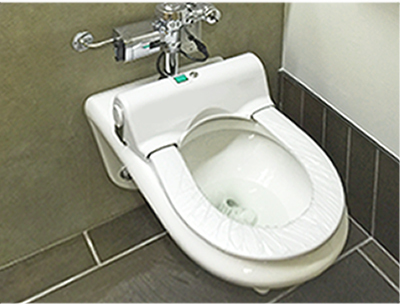 Sanitary toilet seat covers are a great way to drum up business and promote a cleaner shopping environment. Most importantly, it will mean less cleaning for you; you’ll be able to concentrate on the thing that matters most: your business.